Plov comes in various iterations of rice, vegetables, meats, and spices. A customer smokes a hookah inside Khayam, a Tajik restaurant in Moscow. 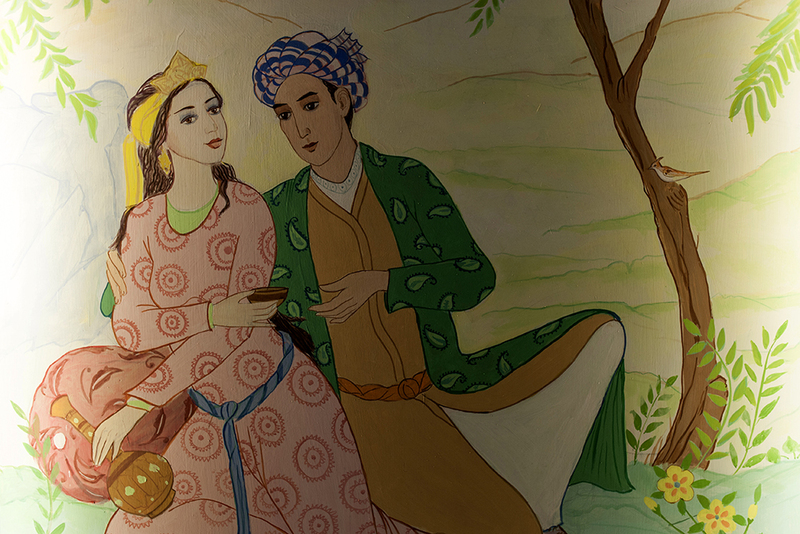 A fresco inside Khayam depicts a scene with people in traditional Central Asian outfits. 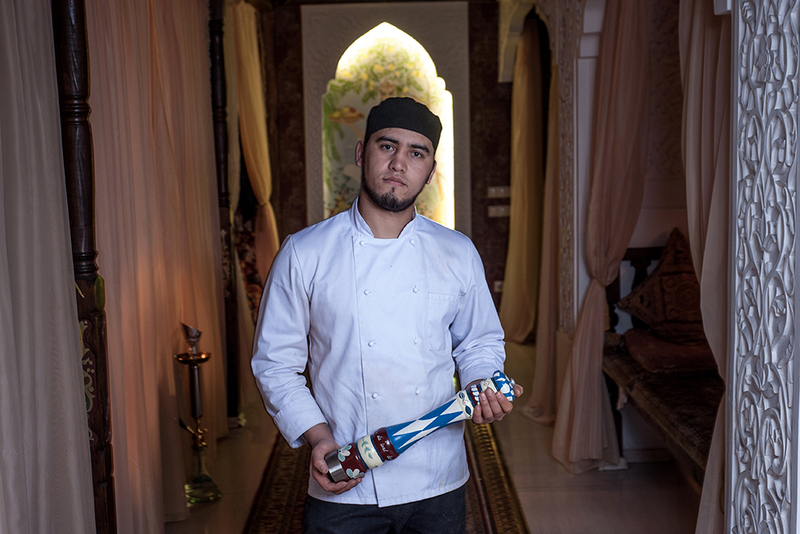 Akhajon Mamurov, a 24-year-old cook at Khayam, learned to work the kitchen at a choihona in his hometown of Kokand, Uzbekistan. Attracting middle class diners, Khayam offers karaoke until 5:30 each morning. 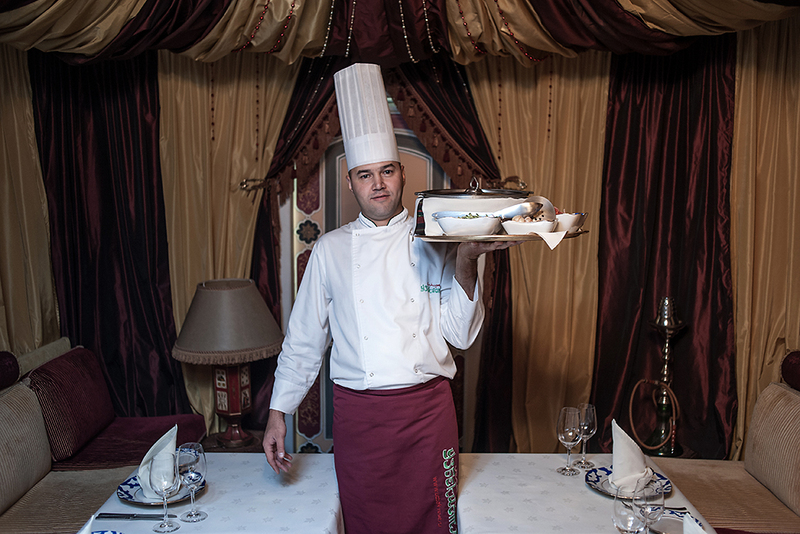 Maruf, from Fergana, Uzbekistan, cooks at Uzbek restaurant Brichmulla and has lived in Moscow for 15 years. 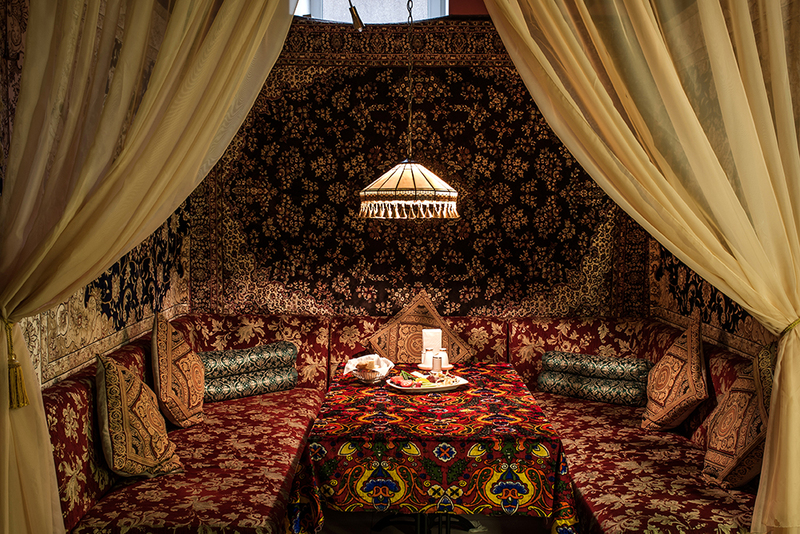 Brichmulla's decor includes traditional Uzbek furniture and scenes of Central Asia painted on the walls. 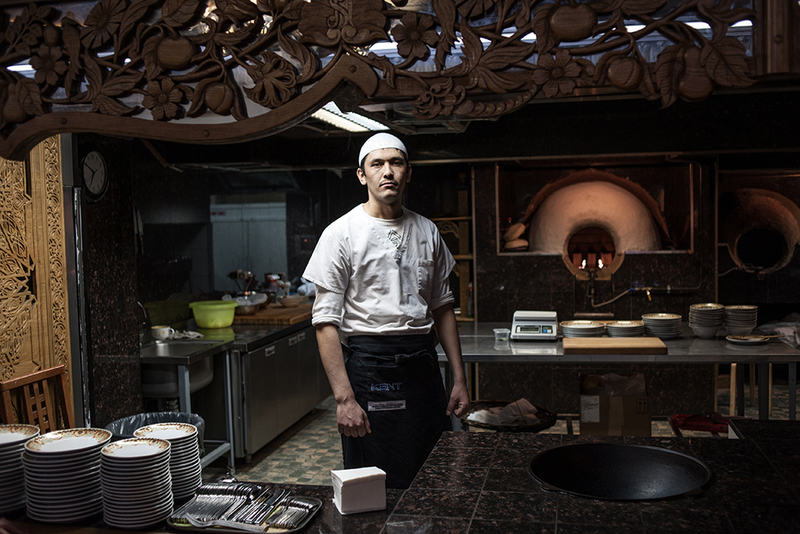 Ziyed, a cook at Brichmulla, learned to cook in his hometown in Tajikistan. 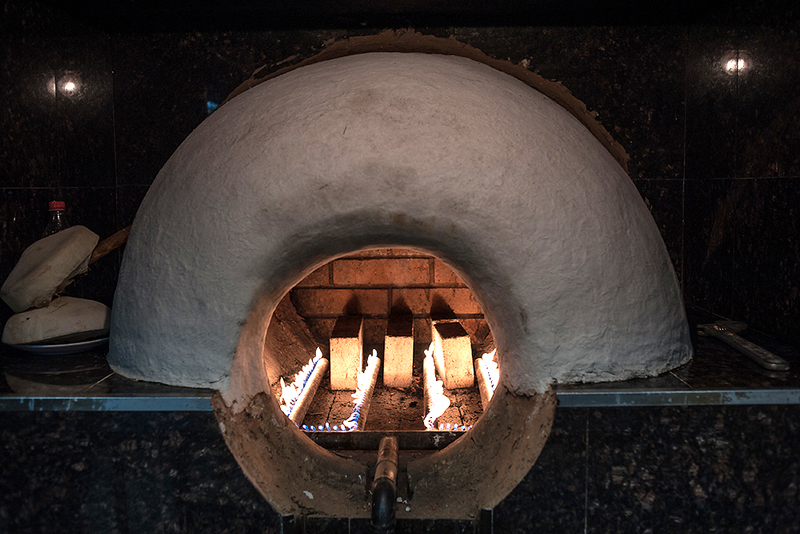 Brichmulla uses a traditional Central Asian oven called a tandyr to cook many of the dishes. Choihona No. 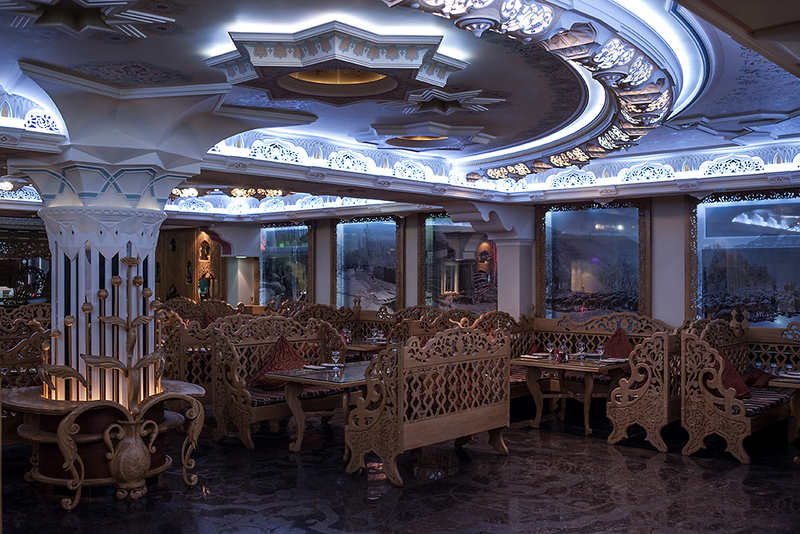 1 ("choihona" is Uzbek for “tea house”) is a chain of 40 Central Asian restaurants in Moscow. Choihona No. 1 delivers 24 hours a day. Customers at the restaurant can drink and smoke hookahs until dawn. Choihona No. 1's prazdnichny (“holiday”) plov is a tiny bit sweet and topped with juicy chunks of lamb. Nadyr Mamayasupov and Anvar Makhmudov, cooks from Uzbekistan, prepare plates of shashlik at Choihona No. 1. Opening in 1951, Uzbekistan is the oldest Uzbek restaurant in Moscow. 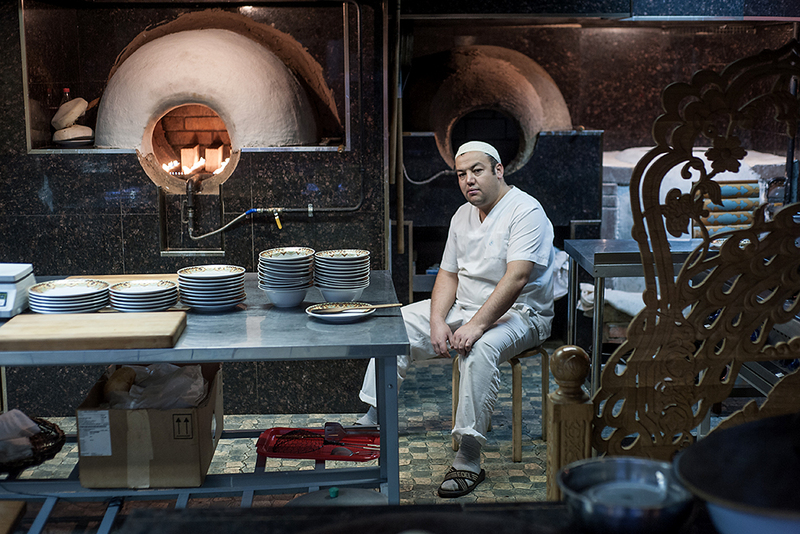 Akmal' Bekmukhamedov, a cook at Uzbekistan, learned to work the kitchen at Cholonzar restaurant in Tashkent. Uzbekistan restaurant was renovated in 1997 with mother-of-pearl-inlaid furniture from Damascus and paneled doors from Morocco. Muscovite Elena Yartseva is a hostess with Uzbekistan, which sits at the highest end of the Uzbek restaurant market in Moscow. Visit a Moscow market, or courtyard, or construction site, and it’s easy to forget you are in Russia’s largest city, not Tajikistan or Uzbekistan. Central Asian languages resound all over the Russian capital. 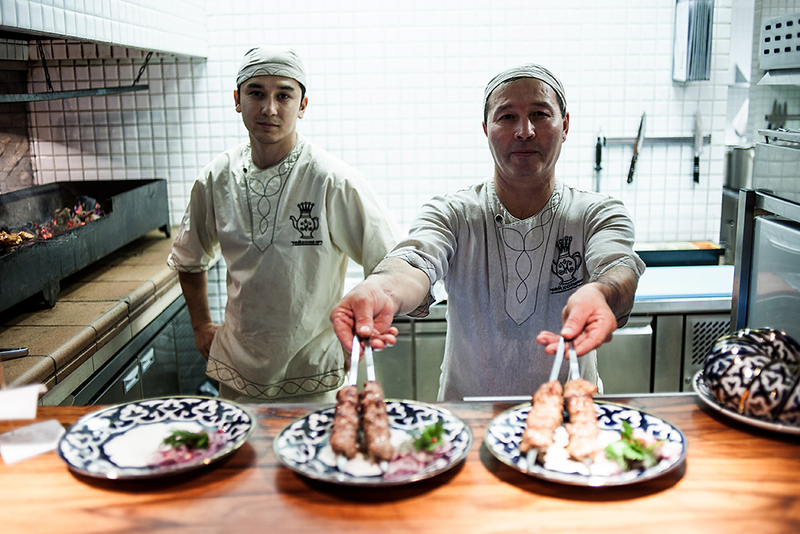 But while the crowds of migrant workers trouble some Muscovites, the recent proliferation of Central Asian eateries – numbering over 239, according to one listing – seems to suit most just fine. Amid these demographic and culinary changes, there has been one constant: plov. This hearty mix of rice, spices, carrots and meat has featured in Russian kitchens for generations. These days, the dish is generally identified as Uzbek, but that was not the case until official Soviet mythmakers made it so in the 1950s. After that, plov became the one Central Asian dish widely known in Russia; over the past two decades, it’s stayed put as a much broader array of the region’s cuisine has turned up, plied by everyone from kiosk food vendors to Russia’s most illustrious restaurateur. “Every Russian family cooked borscht, plov and shashlik [grilled meat]. But nobody really understood or thought about how borscht is Russian, plov is Uzbek and shashlik is Georgian,” said Evgeny Dyomin, head chef at the historic Uzbekistan restaurant in Moscow. Many would counter that borscht is in fact Ukrainian, but that only emphasizes the adaptability and hard-to-pin-down roots of many popular dishes. The food historian and critic Anya von Bremzen says plov – known elsewhere as pilaf and pilau – may have originated in Persia, which had immense cultural influence in both Central Asia and the Caucasus. And plov’s appeal is largely explained by the simplicity and relative cheapness of its ingredients. “You could always find rice. I don’t remember any massive shortages of rice. You didn’t need a lot of meat, just a fistful to flavor. You could always find carrots,” said von Bremzen, author of "Mastering the Art of Soviet Cooking: A Memoir of Food and Longing." Plov’s popularity was cemented by the official Soviet culinary bible, “The Book of Tasty and Healthy Food.” However, the 1939 edition identifies plov as a dish from the Caucasus. The word “Uzbek” does not feature once in the book, which includes recipes for plov with lamb, with fish, with mushrooms, and with pumpkin and dried fruit. 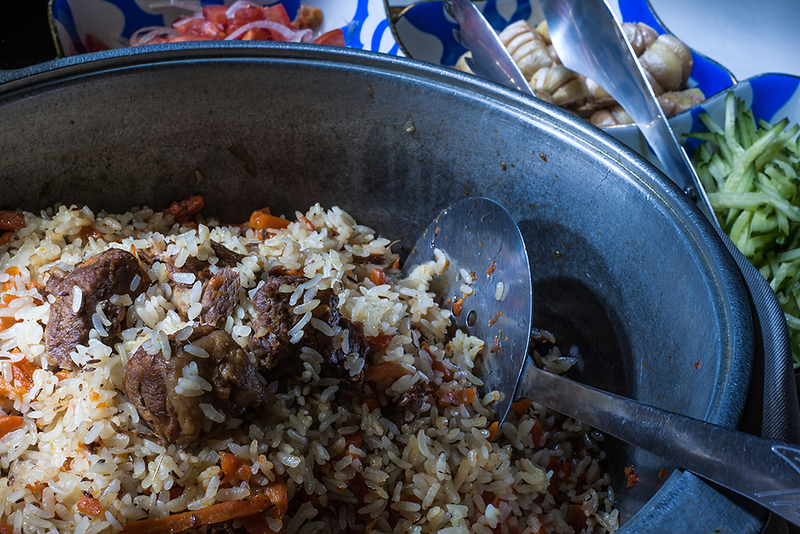 The volume notes that Azerbaijani cuisine includes 30 types of plov and offers a recipe for sweet plov from Guria, in western Georgia. In 1945, Stalin, a native Georgian, served quail plov to Churchill and Roosevelt at Yalta. By the 1952 edition, a recipe for “Uzbek plov” comes just after “Georgian plov”—part of a “politicized” process in which the dish "became" Uzbek, according to Von Bremzen: “The whole Soviet policy of promoting cuisines from the [non-Russian] republics and creating this ethnic canon depended on which republic was more popular at that time” in Moscow, she told EurasiaNet.org. These days, one busy Central Asian restaurant chain, Choihona No. 1 (choihona is Uzbek for “tea house”), taps into people’s longing for the Soviet era—a major trend among Russia’s eateries and food manufacturers. Its name borrows a utilitarian theme from the Soviet period, when Grocery Store No. 34 might have stood across from Pharmacy No. 20. And plov features prominently on the menu. 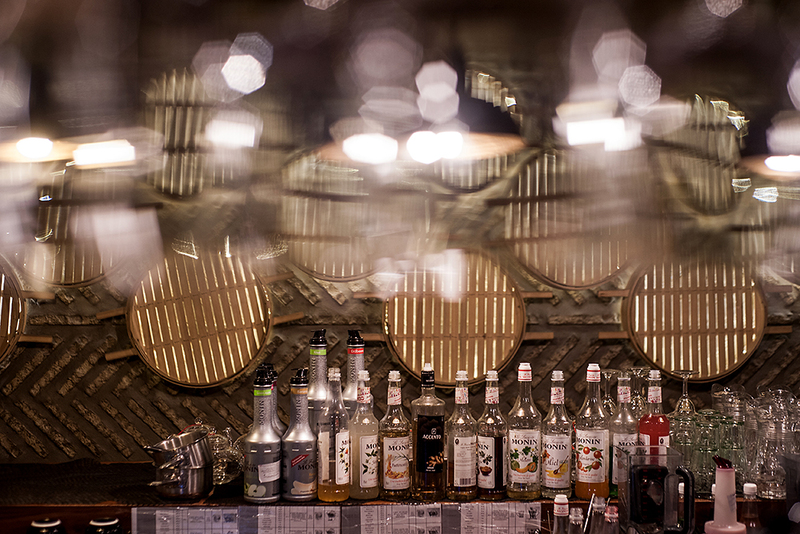 “It’s like some kind of nostalgia—because in Soviet times things were not all bad,” explained Timur Lansky, the founder of the chain, which has 40 restaurants in Moscow. But Choihona No. 1 has also helped make plov, which can be a time-intensive dish, convenient and cool. 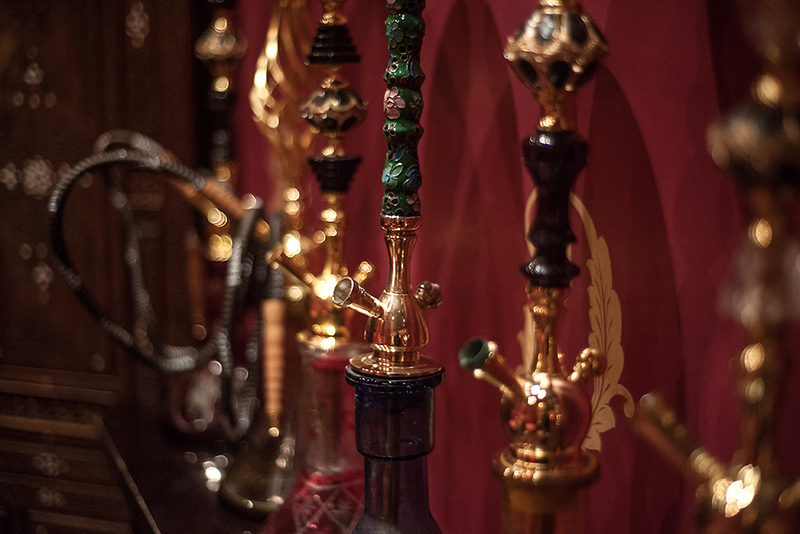 The chain has snug couches where diners can smoke hookahs until dawn. Its prazdnichny (“holiday”) plov is a tiny bit sweet and topped with juicy chunks of lamb. 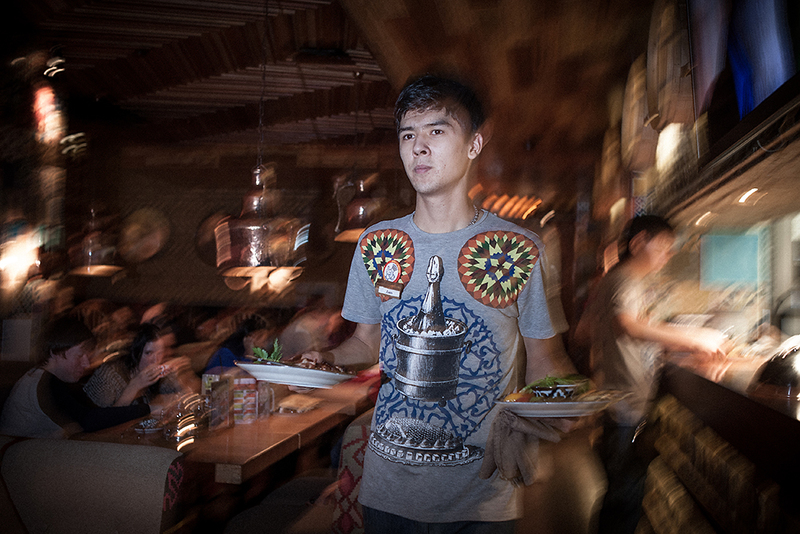 Attentive waiters keep the tea and cocktails flowing, delivery is available 24 hours a day, and prices fall within reach of Moscow’s teeming middle class. At the highest end of the market is the restaurant simply called Uzbekistan, opened by the Uzbek Soviet Socialist Republic’s Ministry of Commerce in 1951, just off Moscow’s downtown boulevard ring. Chef Zifa Saitbattalova, who has worked there since 1985, recalls lines around the block and people paying others to stand in line for them. “The restaurant had separate deliveries of food from Uzbekistan. Food that you couldn’t find in stores you could find here,” Saitbattalova said. Restaurant magnate Arkady Novikov now owns Uzbekistan. 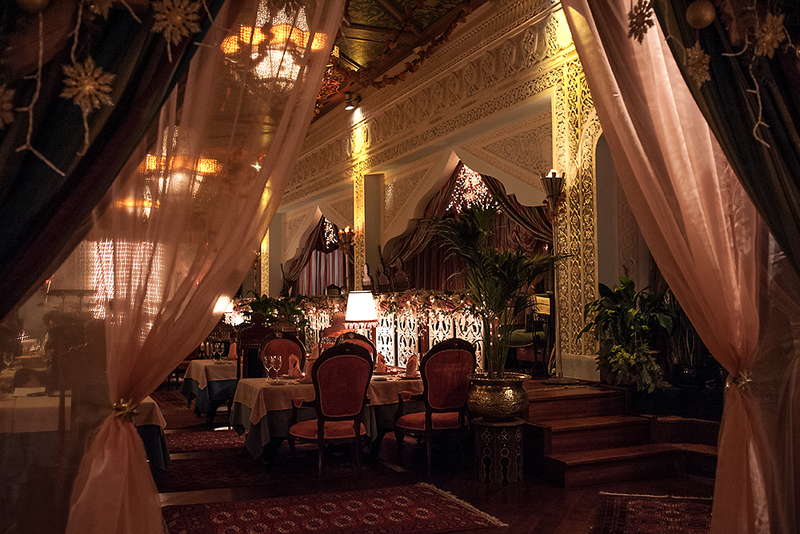 After a 1997 renovation, the upscale restaurant’s ornate interior looks like an orientalist’s fantasy come true. The mother-of-pearl-inlaid furniture hails from Damascus, the paneled doors from Morocco. At lunchtime, a hostess dressed like a belly dancer seats burly, besuited men in secluded nooks. The prices are steep: A portion of plov costs 860 rubles (currently about $14) as compared with 395 rubles at Chaihona No. 1. But the plov – served with fresh tomatoes and roasted garlic – ranks among the city’s best, as does the baklava. 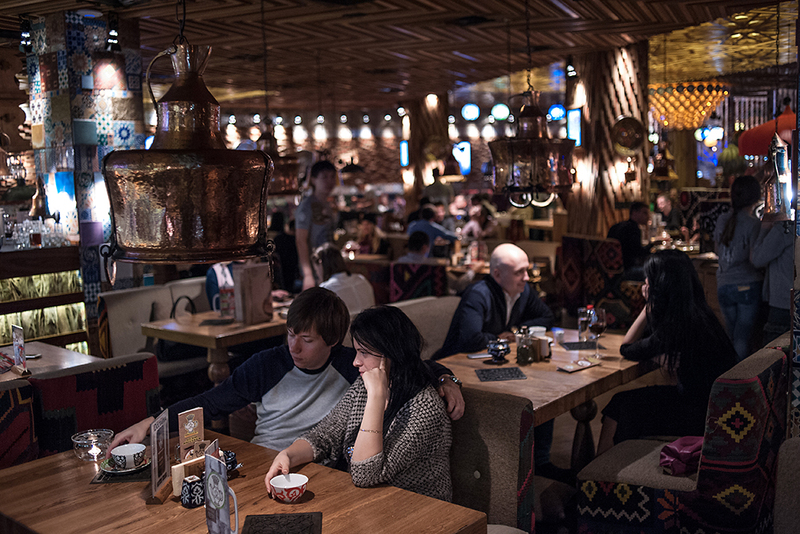 Even in the more affordable of Moscow’s many Central Asian eateries, the clientele seems largely Slavic. “I don't think the popularity of our cuisine was influenced by the torrent of migrants. They don’t influence locals. It is that our cuisine is cheap and healthy,” said Rushan Arslanov, manager of a popular Tajik restaurant, Khayam, which serves a memorable and reasonably priced shashlik lunch, and offers karaoke until 5:30 each morning. For a more family-friendly atmosphere, Brichmulla in eastern Moscow cooks its meat pastries in gas-fired clay ovens in an open kitchen. Waiters wearing long chapan robes, à la Hamid Karzai, scurry about serving some of the best shorpo lamb soup in town. That said, cafes in the bazaars on Moscow’s outskirts do cater mostly to Central Asian migrant workers. The menus are simpler and the food cheaper, but often just as good as the pricier, full-service restaurants. Ironically, much of the Central Asian food in Moscow tastes better than what one finds in the Fergana Valley, where the meat is often dry or gamey and the greasy rice can leave pools of cottonseed oil in the bottom of the bowl. Cafés often offer just one dish, like shorpo, which some travelers associate with a chunk of rancid fat in cloudy water. Excellent food is available, especially in private homes, but dining out can be disappointing. Text by David Trilling, EurasiaNet's Central Asia editor. Images by Moscow-based photographer Konstantin Salomatin.